It will also be able to run Windows 10, for old times sake. Remember Nokia? The company used to be the king of the mobile world back in an era of Nokia 3310s and Snake, but more recently the company struggled to adapt to the harsh new reality of smartphones and apps. But it appears Nokia isn't quite down and out - as Mobile Choice UK reports that new supposed leaks suggest that the company is cooking up a new device dubbed the C1. Positioned decidedly in the mid-range category, the device is rumoured to have a 5-inch screen, full HD resolution, an Intel processor and 2GB of RAM. So far, so ordinary. But what makes it interesting is that the new device will apparently come in versions: on that runs Windows 10 and another that runs a full version of Android. Nokia dabbled briefly with Android ecosystem, under the then stewardship of Microsoft, when it launched the heavily forked Nokia X and Nokia XL back at MWC 2014 - but the Nokia C1 looks to be a fully fledged Android device. As part of the sale with Microsoft, Nokia supposedly agreed to not manufacture any new phones itself until Q4 2016 - which could be problematic, though the speculation is that Nokia could simply outsource the actual manufacturing to another company (perhaps a bit like Google does with its Nexus handsets). Previous to this, Nokia has managed to get around this agreement by making not a phone, but a tablet. 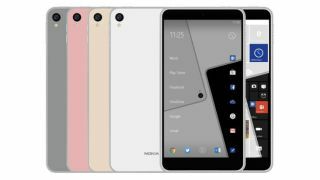 The Nokia N1 was released earlier this year and runs a customised version of Android (Nokia's Z Launcher) - and judging by the leaked images, it appears the same will be the case with the C1.